Despite the fact that I am crafty (of sorts), being consistent with art in our school-time is not one of my strong points. I might incorporate an "art activity" that goes along with the topic we are currently studying, but it is not focused on any specific art techniques or components. It's just doing a project for the sake of doing a project. 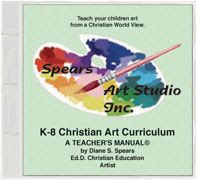 I was THRILLED to receive a full K-8th Christian Art Curriculum from Spears Art Studio to review. Over the last month and a half I have been using it with both my second and first grader and love the techniques that it is teaching as well as how simple it is to integrate into our school day. My girls are really enjoying it too and look forward to the lessons each week. The lessons are divided months/weeks of the year and also by grade level, making it quick and easy to find the grade level that you need. Teaching multiple children at the same time isn't difficult to do and it is possible to use the curriculum year after year without repeating projects since they change based on the grade level your child is in. It is also versatile enough to be used in your own studies or in a group setting such as a homeschool co-op. The Spears Art Studio website has sample lessons available along with more in-depth information about the curriculum. Overall, this curriculum is an amazing deal when you consider that it covers from K-8 for $40 (this includes shipping!) - that's a little less than $5 a year for an amazing art curriculum. I willcontinue to use this curriculum in the upcoming years with my children and am very thankful that it is one that provides a Christ-centered view toward art education. Diane Shields, the creator of Spears Art has a Bachelor of Arts, Master of Arts and a Doctorate in Christian art/education. She has taught in both the public and private systems. If you would like to read other reviews of the Spears Art Curriuculum you can visit the Homeschool Crew blog. What were you using before this and how does it compare? Will you by it now or do you get to keep it because of your review? 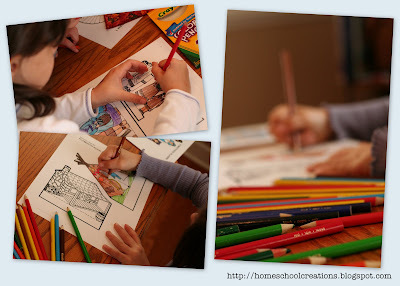 Schoolhouse Store Blog - and $100 Giveaway!